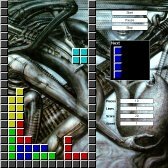 During a lecture about Macromedia Director I wrote a Tetris clone with Director. It's not particularly spectacular but works quite well. Using the Start and Stop buttons you can begin a new game or cancel the current one. The pause button temporarily stops the game. To continue playing, press the Start button. The falling pieces are controlled using the numeric keypad. To play the game you need the Shockwave plugin. You should hide the browser's toolbars so you can view the whole playfield.